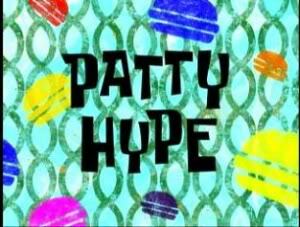 Patty Hype (Episode) – From SpongePedia, the biggest SpongeBob-wiki in the world! The Krusty Krab is filled with cobwebs and even a skeleton, and has had no customers in weeks. One man crawls in claiming that he has not had any food or drink in 3 days. SpongeBob immediately gives him a Krabby Patty, and the stranger refuses. He says that there's no atmosphere in the Krusty Krab, and resumes his search for food and a theme. Mr. Krabs needs an idea, and SpongeBob gives him one. He thinks of 'Pretty Patties', which are Krabby Patties, except they come in a variety of colors. Squidward and Mr. Krabs laugh at him, and say that it's a terrible idea. They even create other ideas such as sequin milkshakes and bowtie French fries to mock SpongeBob, which angers him. He makes a stall by his home selling Pretty Patties and business goes up (albeit after quite a while). Mr. Krabs sees this on the news and decides to take a look. SpongeBob is now serving the 46,853rd customer and had a large sum of money, in fact, that he was giving it away (which of course, allowed them to get back in line to buy more Pretty Patties). Mr. Krabs says that he's never had that many customers in such a small amount of time. He gives SpongeBob the Krusty Krab in exchange for the 'Pretty Patties' stall (as SpongeBob missed the Krusty Krab). However, all the customers want a refund when the Pretty Patties turn them different colors, and start chasing Mr. Krabs around. He calls to SpongeBob for help, but he can't hear him because he's concentrating on the squeaky pickles. This episode was originally called "Pretty Patties". In earlier showings of this episode, including the version available on iTunes, SpongeBob's first customer eats a blue patty instead of a purple one. Now when this episode is shown on TV, he eats a purple patty. In Tom's first appearance in this episode, he is light green. But when Mr. Krabs is burying himself alive, Tom can be seen in the crowd and he is his normal color. What happened to Patrick after he gave away the free money? When Mr. Krabs took the Pretty Patty stand from SpongeBob, he and the stand were the only things there. This page was last modified on 15 August 2010, at 08:43.